In the midst of our recent featherless Jurassic Park posts, I recollected this drawing of mine, which I now offer as my utterly trivial contribution to the discussion. Perhaps it panders too much to the 'Awesomebro' culture so aptly elucidated upon by John Conway, but for the present at least, I think it serves a small, if not especially profound, purpose. I posted this drawing over on Himmapaanensis and elsewhere last summer and under quite different circumstances, a while before David very kindly invited me on as a contributor here, so I apologise to those who are seeing it again once too many times. Carnage of one kind or another has long been a staple of our fascination with dinosaurs. Give a child two dinosaur toys and you can be reasonably certain that within a few minutes they’ll be banging them together and making growling noises, spilling imaginary blood and viscera onto an imaginary, primordial landscape. It was only a matter of time until the dinosaur toys turned pixilated, and thus we got what I consider to be the pinnacle of (the admittedly small) group of dinosaur beat’em-up games: Primal Rage. Debuting as an arcade game in the 90 s, Atari's Primal Rage was a traditional 2D “versus” simulator set in the very traditional mold. Players selected from a menagerie of quasi-prehistoric beasts and battled it out across a variety of landscapes. In this, it was not particularly different from the later Jurassic Park: Dinosaur Battles, although the latter was arguably far better animated. 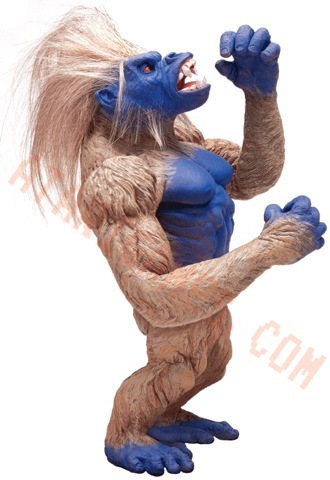 What sets Primal Rage apart, however, is its back story. Cataclysm. A falling asteroid slams into our civilized world and wipes it clean, killing millions and transforming the worlds surface. The land burns, a twisted hell of radiation soaked jungle and naked stone, and from the devastation of the murdered cities come forth the new gods. The carnosaurs Diablo and Sauron represent Chaos and Hunger, respectively. One seeks to burn the world; the other, to devour it. The dromaeosaur Talon is the god of Survival, fighting for his tribe. Vertigo is a lovecraftian, serpentine monstrosity that embodies madness. The herbivorous Armadon is lord of life, arising from his meditations to battle for the growing world. Finally, the two giant apes (for since King Kong, giant apes and dinosaurs have gone together like chocolate and peanut butter) Blizzard and Chaos represent Good and Evil. The surviving remnants of humanity worship these beasts as totems, but the new gods hate one another. Constantly at war, the beasts fight over the ruins of the old earth, and one of them will eventually succeed in reshaping the new world into something more to its liking. There’s something strangely compelling about this scenario, relayed in bits and pieces through images and text throughout the game. Owing a little to classic kaiju films and a lot to Topps “Dinosaurs Attack!” trading cards, Primal Rage went above and beyond in delivering an entertaining world, and one that held a good deal of potential for an actual story. Indeed, Atari must have thought so as well, since they more or less immediately put a sequel into development, released a licensed comic and novel, and put out toys to allow children to bash their favorite monstrosities together in the real world. Unfortunately, this flood of merchandising ran headlong into the game’s other defining feature: bloody violence. 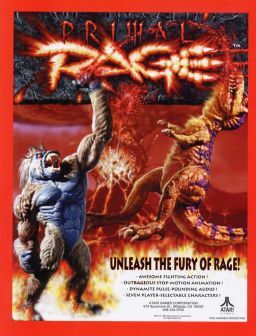 Primal Rage was a gory game. Its characters bit, smacked, clawed, and tore bloody chucks from each other, in addition to a variety of special attacks that ranged from the predictable (super powered bite) to the gag inducing (acidic golden showers.) There was something of an uproar when parents discovered that not only were the dinosaur attacks exceedingly visceral, but other unpleasant bodily fluids were involved. Understandably perturbed, they kicked up enough of a ruckus that Atari rapidly pulled the game off the market and released a censored version that kept most of the blood but removed the more objectionable content. But this was the end of Primal Rage’s brief brush with any kind of relevance, and the game sank into obscurity, dragging down the sequel with it. There were and are a few die hard fans of the game, but by and large people moved on to other things and the franchise never really recovered. I think it’s a shame. While vile and nasty, it had more of a story then others of its type, and the creature designs were rather creative. Perhaps if Atari or some other company remade it, it would finally find the audience that it deserves, and we could once more have a chance to bang our toothy toys together and growl. This was originally published over at The Faster Times and is reproduced here with permission. I've been thinking about dinosaurs, monsters, and Jurassic Park. Recently, the director of Jurassic Park 4 tweeted two words that have unsettled a lot of us over here at LITC: "No Feathers." I suspect he was trying to reassure anxious fans who were worried their precious monsters would be defanged and made cuddly by the addition of plumage. Unfortunately, I think in the process he completely undercut the facet of Jurassic Park that gives that film (and to lesser extant its sequels) enduring power. Jurassic Park, it has been widely pointed out, is revolutionary not just for its special effects but t from the way the dinosaurs were depicted as real animals. Huge, yes, perhaps monstrous in form, but with the body language and presence of living creatures. When I think of Jurassic Park, my first thought isn't necessarily of raptors in the kitchen. It's of the cocked head and curiously dainty step of the Tyrannosaur as it climbs over the rim of its enclosure. It's of a panicked flock of Gallimimus arcing over a grassy field toward the camera. It's of the closing moment of the The Lost World, where we glimpse a primeval world without humans, where the carnivores don't always roar and the herbivores can go about their business. But why is this so revolutionary? There have been hundreds of other films with dinosaurs in them, often with impressive special effects, and yet few of them have made their mark on people the way that Jurassic Park has. Why does the attempt to treat dinosaurs as living animals hold such a powerful grip on our imaginations? We'll never truly be in the presence of dinosaurs. The dead are long gone, their very bones frozen in rock, echoes of a world we can never touch. And, like all of the dead, when we try to raise them they return as monsters. The jaws in the water. The terror in the forest. The horror out of time. The grinding, inexorable certainty that all of our achievements, all of our struggles and triumphs, will be washed away just as surely as they were, and nothing will be left to remember us. How can any creature survive under a weight like that? How can we watch King Kong or Godzilla, or The Valley of Gwangi, and hope to see anything but monstrosity, things that don't fit, symbols of what should not be? Those figures have as much to do with real dinosaurs as a reanimated corpse has to do with a man. The form's right, but everything else is wrong. They might as well be dragons. But Jurassic Park changed that. For moments, the dinosaurs were narratively unencumbered, allowed to exist undefined by human ideas. For a moment, we got to walk up and peer past the fence of story, of drama, of horror, and see the animal beyond. The two islands were places of terror, yes, but of wonder, too. Moments of death were balanced by vistas of life, and for all the moralizing about the folly of bringing dinosaurs back, their very existence on screen gave reason enough. That's why the "no feathers" tweet depresses me. It signals that the change begun in The Lost World and Jurassic Park 3 is going to stick. The dinosaurs will once again be ravening caricatures rather then real animals, symbols existing only to persecute and punish mankind. And once again, we'll be denied that precious glimpse into a distant world. Cross Isla Sorna and Isla Nublar off your mental map. There's an inscription there, now, signed and copyrighted and trademarked. Photo by Juliana Cortés, via Flickr. I don't hate Jurassic Park. I may have a complicated relationship with it, but that's pretty common. Even if Colin Trevorrow had announced feathered theropods would be part of JP4, anyone would be wise to keep their expections low for a long-delayed continuation of a franchise of such severely diminishing returns. If you're one of those who has no problem with naked dromaeosaurs in the next movie, more power to you: I hope you enjoy it. I really do! There is no reason to show feathered raptors in JP4, because in the world of JP raptors are those seen in JP1 (and I'm not among those mentioning genetic mutations or frogs as a justification of that look: simply, JP is a 1993 movie and represents that epoch iconography). I hated the "crested" raptors in JP3 because they differed from those in the first movies. I'm happy dinosaurs in JP4 will retain the look of the first movies: JP is not a documentary, and should not be forced to be "updated" to the "real world". In the JP-verse the dinosaur look is the one shown in JP1 and must remain that one until the end of the saga. Sequels must follow the original style, since they are part of the same "universe". Otherwise, they are not sequels. Do you want feathered dinosaurs based on 2013 science? Ask for a reboot. These are fair enough points, and as I said above: if this is your expectation for a new JP movie, I hope this one satisfies you. For my part, I don't really care about the Jurassic Park universe or canon or iconography (now that I think about it, changing the design of the Jurassic Park visual identity would offend me more than altering creature design). In his post at Laelaps, Brian Switek ably shows that neither, apparently, do the filmmakers. ...the franchise has already changed its dinosaurs several times with no explanation. The first sequel introduced new color palettes for the dinosaurs, as did the third film. (Not to mention the fact that Jurassic Park III raises the mystery of why Site B contains species that InGen didn’t clone, and never actually resolves this point.) If the dinosaurs are changing from film to film to start with, why not take a jump and show audiences something they have never witnessed before? If it's intricate world-building I'm looking for, I've got plenty of other places to find that these days. Still: there are plenty of ways that a good writer could not only incorporate the new science of feather origins in Jurassic Park 4, he or she could make it work thematically. One general scenario that springs to mind would be that the film could use changing science as a way to mirror uncertainty and progress in the lives of human characters. The characters are now faced with animals that blur the line between "reptile" and "bird," animals InGen rejected and hid from the public. How would Grant - if he was part of it at all - react to this? How would he transition from his "I'm out of a job" attitude to a realization of just how twisted from reality the animals he faced on Isla Nublar were? What wonder would he feel faced with a resurrected but abandoned ecosystem of feathered, fuzzy, prickly, spiny, dinosaurs? Though Andrea dismisses it, the fact is, Jurassic Park contains the seeds of changing creature design in the canonical fact that the animals were engineered to satisfy public perception. There's terrific stuff there to write for! After all, suspense and fear are a huge part of the cinematic experience of Jurassic Park, and fear of the unknown, of the ground shifting under our feet, is a big reason a large part of the public distrusts, rejects, and ignores science. If you think this is all too heady for a Jurassic Park film, I'd disagree: a book and film that introduced me as a teenager to paradigm shifts and chaos theory has plenty of room for such philosophical content. The fact that Jurassic Park III lacked this element is part of what makes it such a forgettable movie. Trying something like the concept I sketched in broad strokes above could result in a Jurassic Park movie as meaningful to its time as the first one. That's not something worth shooting for? The moment seared into my memory, when a movie actually made me see the world differently, was the first time I saw that shot. Certainly, Mr. Brachiosaurus showing off by standing on two legs was impressive. Absolutely marvelous. But it was just a set-up. When that shot was projected onto the screen, it was a punch to the gut. Suddenly, dinosaurs were alive again, and how I'd always dreamed of seeing them: casually going about their lives. Moving like animals move, with weight. Rendered a bit hazy by the distance. Put into better perspective by little white specks of birds flying over sparkling water. As if I was out hiking, and happened across the scene upon cresting a hill. It was a rush. A deep, satisfying realization of a wish I knew was foolish. And I realized it as it was happening: this is the closest you'll ever get to it. In my brain, I'd be happy for JP to die and let someone new figure out a way to make a big Hollywood dinosaur movie. Forget reboots, forget sequels, leave Jurassic Park trapped in the amber of the 1990's. Reinvent big dinosaur adventure totally. In my heart though, I'd like to return to Jurassic Park. I just think we've grown apart. I'm one of those sticks-in-the-mud who is disappointed that I won't get to see gloriously feathered theropods in Jurassic Park 4, but I also must give director Colin Trevorrow the benefit of the doubt: after all, his promise that there wouldn't be any feathers in JP4 may have simply meant that he plans on not including any feathered taxa in the film. Why, that would be perfectly fine! I'm no theropod chauvinist. And wouldn't you know it, I've got a little wishlist for just how the humans-on-dinosaur conflict could play out, excluding those pesky feathered animals that have devoured the news for the last two decades. 1. Marauding bands of drunken, surly Plateosaurus. 4. Ever see Attack of the Killer Shrews? That, but with Fruitadens. 5. Oryctodromeus totally, like, burrowed... so maybe they were like Mesozoic myrmeleontids (or graboids)? Why not. While some of these would arguably bear quills or fuzz or whatnot, leaving those out are probably more forgivable than sad, nekkid dromaeosaurs. All the drama, suspense, and spine-tingling action we've come to expect from the esteemed franchise, none of the dinosaur nerd whinging. Win-win! Marc intimated yesterday that there would be 'a treat' from me this evening. I'm afraid it's nothing of the kind. 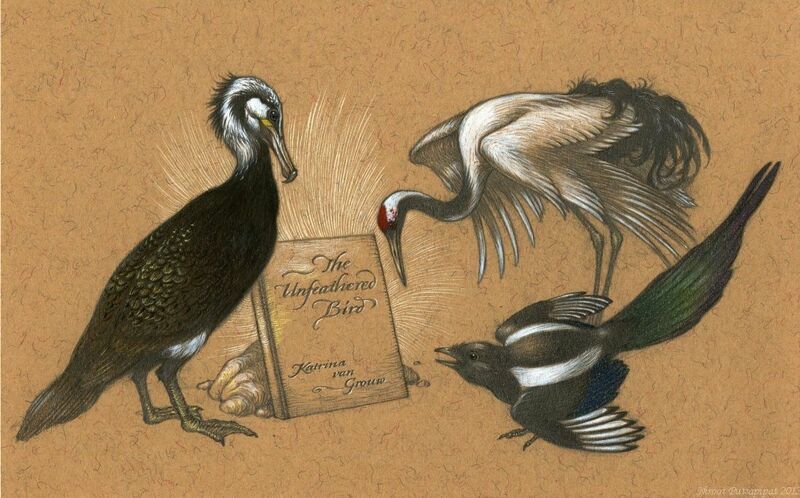 I had originally asked that this drawing be appended to the end of Marc's review of Katrina van Grouw's The Unfeathered Bird, on the grounds that its indulgence qualified it poorly for a post of its own. But Marc insisted it be posted alone, presumably to absolve himself of any involvement or blame. 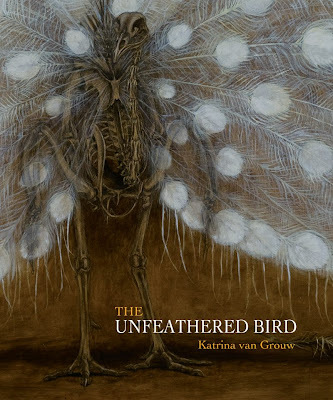 Katrina van Grouw is without question one of my most admired living artists. I could never have supposed that my work could have caught her attention, never mind have her pronounce it as 'exquisite'. How then should I describe having actually met her? Here, therefore, is an avian portrait of Marc (the magpie) and I paying obeisance to the great Katrina, who, as I've ascertained, is a cormorant. It was from this meeting that we were able to gain a few insights into the dedicated, painstaking creation of The Unfeathered Bird, and learned that the book's dedicatee, 'Amy', is indeed a dead duck. I hope you can forgive this indulgence of a post, and I promise that the next piece of artwork from me will be a non-avian dinosaur. In the meantime, if any reader is still vacillating about whether or not to purchase this book, they shall be roundly shunned by at least half the Chasmosaurs team. So there. I really enjoyed Safety Not Guaranteed, so my hopes for the fourth Jurassic Park were raised a smidgen when Colin Trevorrow was confirmed as the director. Among the many worries from fans for Universal's Jurassic Park 4 was the possibility that we could see dinosaurs covered in feathers, as opposed to dinos in their classic form. The last installment in the series, 2001's Jurassic Park III, featured velociraptors with feathers. However, Safety Not Guaranteed director Colin Trevorrow, who was recently hired to helm Jurassic Park 4, has taken to his Twitter account to confirm that there will be "no feathers" in the sequel. Trevorrow was reportedly chosen due to his love of the original trilogy and knowing how the world works. Are you happy with the decision to not include feathers? No, comicbookmovie.com, I'm not. No use for this franchise anymore. Give the dinosaurs to someone who actually cares about them. Glad the fans are relieved, though. 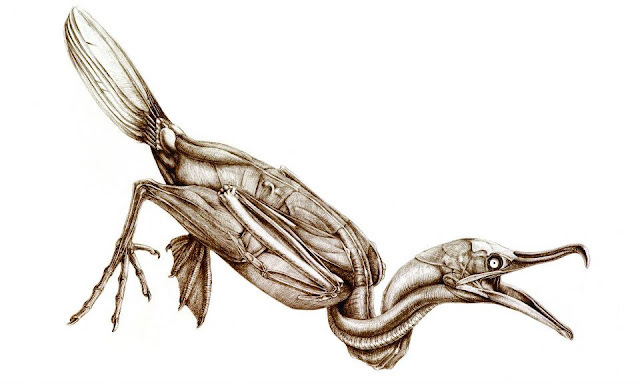 As you are no doubt already aware, The Unfeathered Bird is packed to bursting with sumptuous anatomical illustrations of birds. At the very least, they are missing their feathers; in many cases, they are reduced to their skeletons. Katrina worked as the curator of the bird collections at the Natural History Museum (in Tring, where they are based) for 94 years*, and one would be forgiven for assuming that the majority of the pieces in The Unfeathered Bird are based on pre-assembled, pristine, complete, mounted skeletons, the likes of which you might see on display in the museum. In fact, a great many of them are based on specimens that were quite literally in pieces - a bone here, a bone there, that Katrina had to painstakingly reconstruct. It makes the sheer achievement in putting this book together all the more astonishing. For example, how many people would guess that a robin (above) has such long, elegant legs and feet under all that floof? Not to mention the fact that, shorn of feathers, its stubby wings look ridiculous. The Unfeathered Bird also contains a sojourn into the terrifying Twilight Zone of domestic fowl, in which the hand of humanity has warped nature's creations in ever more bizarre and twisted ways. It's not for the faint hearted. The Unfeathered Bird is a rare book that can be appreciated equally from scientific and artistic perspectives; educational and insightful, it can also be enjoyed as art purely for its own sake. The animals are meticulously reconstructed, detailed down to the last suture and often posed as if engaging in intriguing behaviours, such as the (plucked) sparrowhawk plucking its pigeon prey, or the trumpet manucode displaying with its amazing coiled windpipe on view. The accompanying text naturally takes a back seat to the artwork, but is nevertheless a warm and informative read. We have a lot to thank Amy for. In short - buy it immediately. IMMEDIATELY! 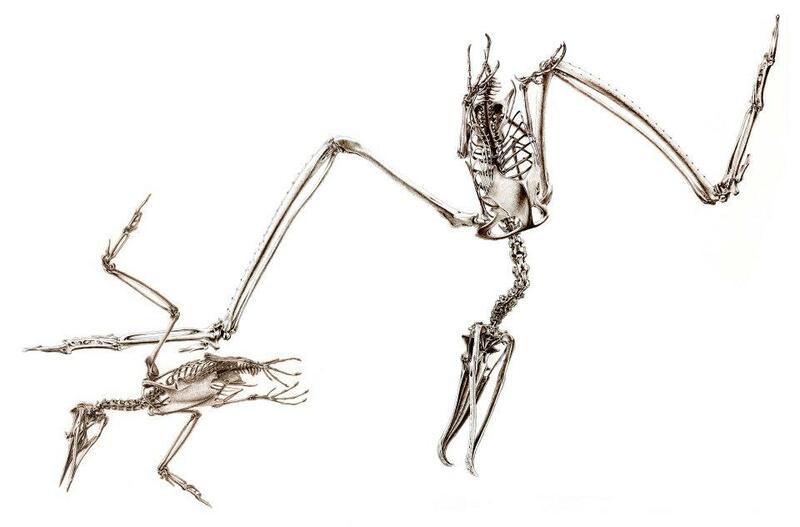 And if you get the chance, do pop down to Tring to check out The Unfeathered Bird exhibition at the Natural History Museum, which is free and runs from March 22 until May 5. *Sorry, it's a New Scientist/Private Eye referencing in-joke - it was actually seven years. Recently, Asher shared a comic book cover that featured a Gurney-inspired feathered Therizinosaurus, as well as a behind-the-scenes look at the models that brought Jurassic Park to life. Today's post is of a piece with those, I think. You don't have to look at the highest forms of art and popular culture to see how public perspectives on certain topics are changing. You should also look at those things pitched at the general public. Nothing fits that description better than advertisements for McDonald's. Ad agency Translation, recently rolled out a set of stylish commercials for the Big Mac, and one of them, titled "Mouthtopia," features a pair of dinosaur-ish creatures which look quite different than what we were used to in the Jurassic Park era. When I saw this, I was intrigued by what sure seemed to be a pair of therizinosauroid theropods, bearing a suite of display features that are positively All Yesterdays in appearance. Plus, the animation is honest-to-goodness stop-motion, bringing me back to childhood mornings spent at Pee-Wee's Playhouse and watching Harryhausen flicks on VHS. I had to know more about this commercial. In an advertisement, I'd have expected to see boring, rote characterizations of prehistoric animals. This is altogether different, so I set myself to some sleuthing and learned that it was produced by Buck, a Los Angeles production company, with animator and designer Jon Gorman serving as art director. (you can also watch the clip at Buck's site). Jon was kind enough to respond to my questions about the spot. He was generous in his response; blockquotes below are his words. I began by asking about how the idea for this commercial came about. Our initial brief from the agency was that the world that the spot takes place in had to be a sort of savage utopia: something that is fantastical and untamed but still inviting, kind of like a friendlier version of the 80's Conan films. Additionally, it was important for the campaign, and for us, to be as true as possible to the period of film-making in terms of production as we could feasibly be — hence the matte painting, miniature set and stop-motion animation process typical of the time. When I first wrote Jon, I asked him if therizinosaurs were indeed the inspiration for the creatures. They weren't, as it turned out. "Wow, a few depictions of Therizinosaurs are really close to where we ended up!" he wrote back. "I would have loved to get those arms/hands in there, despite being a little terrifying." He went into more detail about how exactly they designed the dinosaurish creatures. When we did some initial concept art of the layout we tried out a few things to find that balance between realism and fantasy in the landscape — Most of which you can see in the final spot; the cliche waterfalls, the sweeping mountain vistas and so on. A logical addition seemed to be the addition of an animated creature that hit the same balance of believability and fantasy. Sébastien Iglesias and myself did the initial concept art, taking a lot of reference from large ground birds like emus and cassowaries along with more recent depictions of similarly proportioned dinosaurs and a lot of period design stuff from the likes of Harryhausen. The basic framework we built from is that of a brachiosaur, but playing with a lot of anatomical stuff that we kind of guessed at for display and producing sound (you can see from the early art that we had a lot of frills, bird-like wattles and vocal sacs). After that first round we pretty quickly narrowed down the direction and started on detail work, again taking a lot of inspiration from modern birds. The colour choices were partly a contrast choice with the background environment and the (I think) reasonable assumption that there is no reason and prehistoric beast shouldn't be as colourful as something like a Cassowary or Peacock. 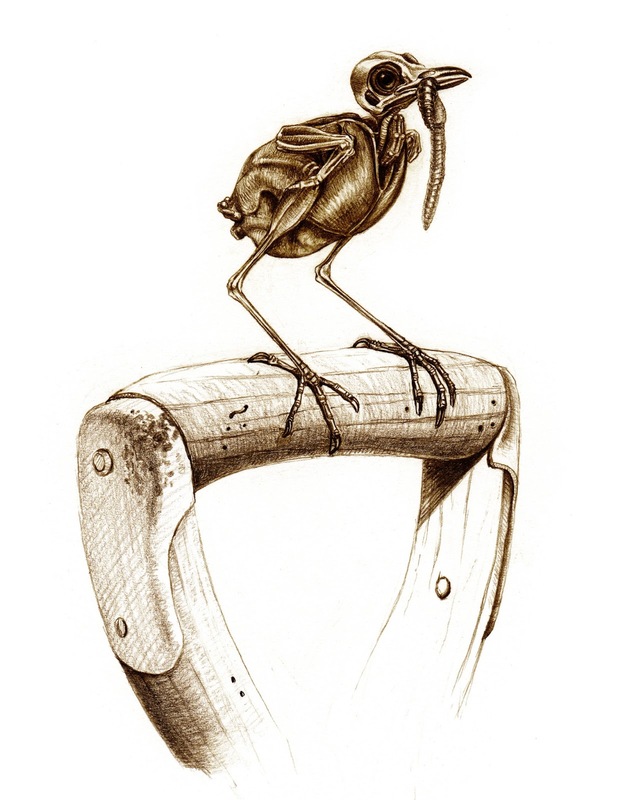 Iglesias features some of this concept art at his blog, in which more of the creatures' bodies are revealed; they really are like Cassowary-sauropods. Of course, all this didn't mean anything until there were real, physical models to bring to life. Gorman shared that process, as well. The build was sculpted, molded and them made in to a silicone/latex cast over a foam armature, made by Kelly Goeller and Victoria Arslani, who also built the landscape. It was then was hand-painted by Victoria. I animated 5-6 takes of the creature on set, which we then retimed and composited in to the scene. Honestly, I think they kind of made the spot and perfectly hit the tone we were going for in terms of both design and animation, as well as being an unexpected climax to the slow camera push on the product. I'd like to thank Jon getting back to me; I really had little hope of finding out this much about the commercial. While these aren't meant to be totally accurate depictions of prehistoric life, I'd argue that an effort like this, geared for the masses, should be of comfort to those of us eager to see the public's imagination expanded when it comes to how dinosaurs and other extinct animals may have lived. 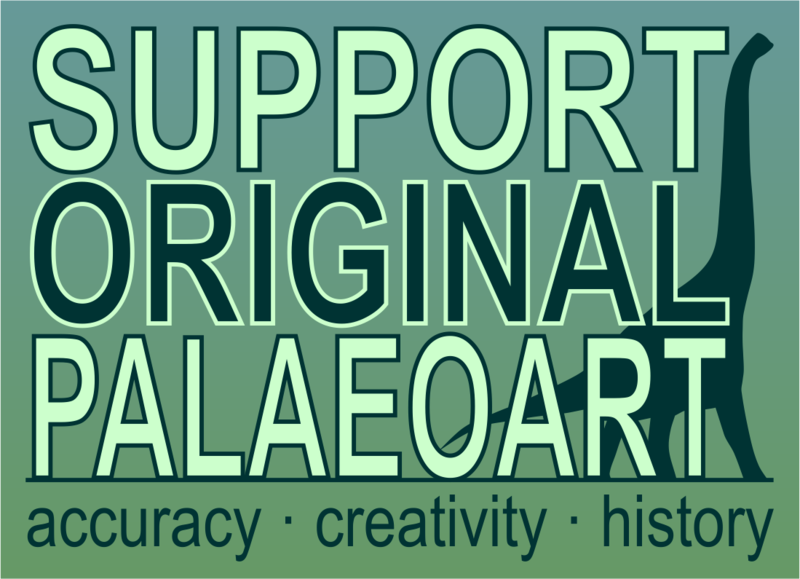 Even if these "'brachiocassowaries" don't register as dinosaurian to most people, it's nice to know that a spirit of daring, All Yesterdays-esque exploration is alive among the concept artists, VFX workers, sculptors, and animators who make imaginary worlds come to life. It's well known that Jurassic Park revolutionized CGI effects in cinema, but what tends to be forgotten is how much incredible practical work went into creating the dinosaurs of Isla Nublar. The Stan Winston School has been seeking to remind us of it by posting a series of behind the scenes videos narrated by the effects technicians themselves, and they are a must watch for anybody even remotely interested in special effects. Or, well, dinosaurs. Prior to watching this, I was unaware that there had been raptor suits at all. I'd assumed the dinosaurs were mostly animatronic rigs. The pronated hands and lack of feathers, of course, are enough to make one twitch, but I'd love to run around in one of these costumes myself. ...although the Dilophosaurus isn't any slouch either. And finally, a little bit of rod-and-puppet work on the ambiguous small theropod that pops up in "The Lost World." I absolutely refuse to call it Procompsognathus. See more cool special effects videos over at The Stan Winston School. It's worth an hour or two of your time. There are a select number of popular dinosaur books in which it becomes apparent, quite quickly, that the author really didn't do an awful lot of research on the subject - and so it is with Dinosaurs, a book that could pass for a 'greatest hits' of palaeontological howlers (circa 1982). Of course, when a book is over 30 years old this has a tendency to add to its charms, rather than induce one to pen a deranged letter in green ink and mail it to the publisher; what's more, it also happens to be a delightfully executed pop-up book. If it's a rapid route straight to my heart that you're after (and why wouldn't you be? ), you can't go far wrong with a pop-up book. 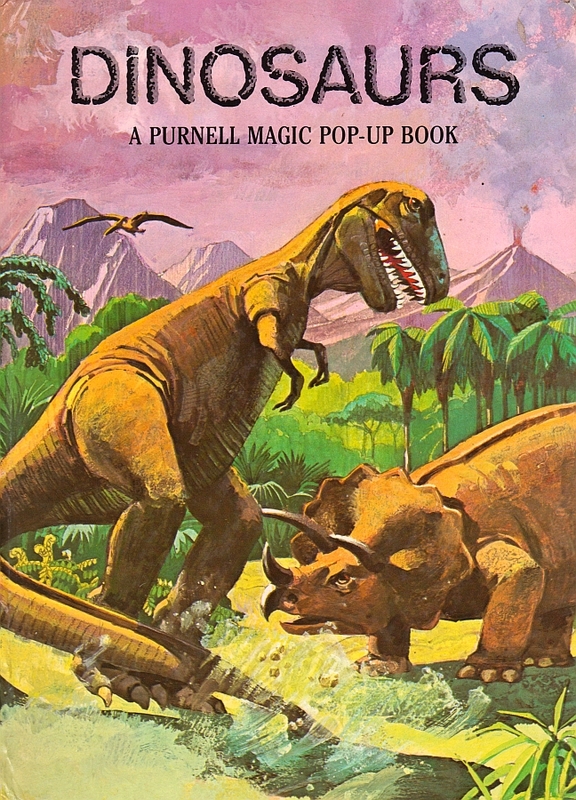 The cover of Dinosaurs provides a pretty good indication of what to expect inside - that is, all the stock clichés of dinosaur books from the '60s and '70s. A tottering Tyrannosaurus, resembling a rubbery costume from one of the more ropey kaiju films, confronts a rather podgy Triceratops, while an erupting volcano and pterosaur provide background filler. Of course, this is not to knock the illustrator, Borje Svensson, too much - he was probably given very little to work on, especially as the book apparently lacked a scientific consultant. The opening spread features a couple of very neat ideas, courtesy of John Strejan (design), Tor Lokvig (paper engineering) and, of course, Svensson. Having the animals' vastness emphasised by exploiting the potential for verticality in a pop-up (or, having it pop out in your face like) is always an excellent idea, and it works particularly well here as the sauropod skeleton unfolds slowly when the page is opened, making the final reveal (and the way it dwarfs the puny humans) all the more impressive. Down below, there's an excellent use of slats to transition from a fleshed-out sauropod to a behatted man excavating its ribcage, all those millions of years later (it having apparently been petrified where it stood, or perhaps hastily buried in the Great Deluge, an idea apparently now back in vogue among a certain group of delightfully nonsensical morons). ...even if the Pteranodon does not appear best pleased with the whole silly situation. Being referred to as a "dinosaur of the air" will probably do little to alleviate its temper, either. 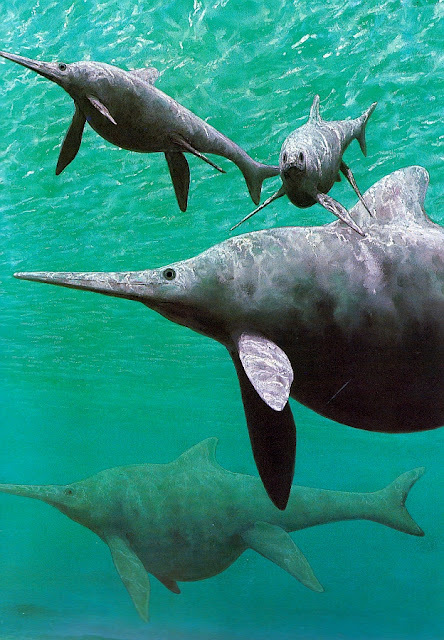 The plesiosaur in this illustration may be a little, uh, fanciful (at least it has retracted nostrils! ), but I have a soft spot for the ichthyosaur. Svensson has done a lovely job in depicting the sea spray around the speeding animal, while the pull-tab feature is excellent - the animal rears up to grab the fish, and snaps its jaws with a scissor-like action. It's also possible to force the plesiosaur's head downwards, but doing so is ill-advised; clearly, it's had quite enough to eat already. The book's spectacular centrepiece features - what else? - a clash of the saurian titans involving the 'King of the Dinosaurs', Tyrannosaurus rex (as tall as "two houses"), and its noble armour-plated adversary...Stegosaurus. It's an awesome multi-layered pop-up, with Stegosaurus employing its spiky distal end in an attempt to gouge some interesting pathological features into T. rex's precious face, but...come on now, really? 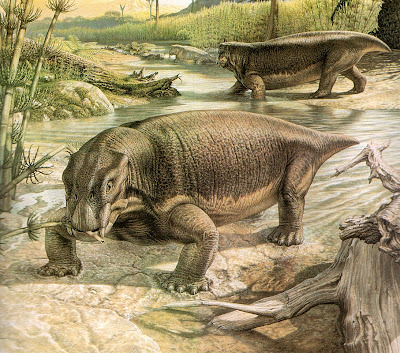 As any kid with a healthy interest in extinct megafauna will tell you, the two combatants in this admittedly impressive piece were separated in time by something in the order of 85 million years, which is no trivial span. Perhaps this book really was inspired by the Rite of Spring section in Fantasia. This Triceratops represents another superb use of the pop-up format - with its horns protruding from the page in a suitably confrontational manner - even if the animal itself looks rather bizarre, with its squat body and double nose horn (which might be a misplaced beak). Meanwhile, cheeky Struthiomimus, having sprouted an extra digit, is making off with somebody's egg as per bloody usual. 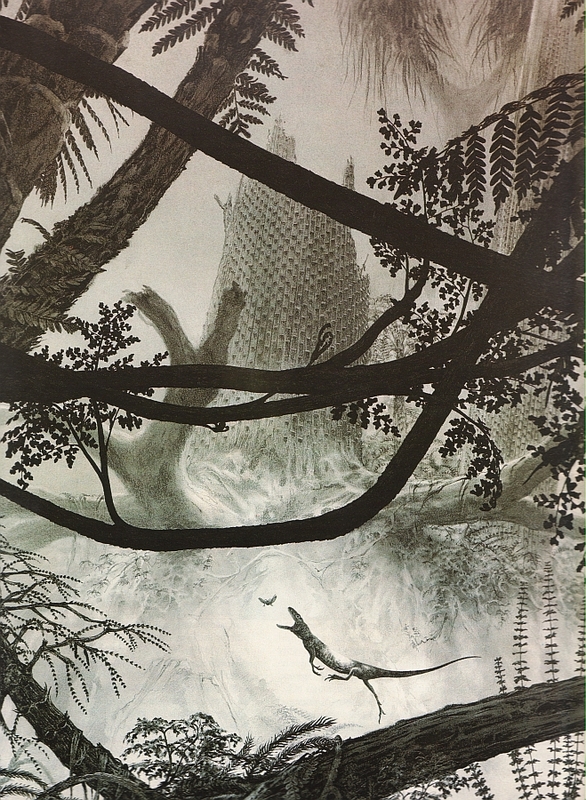 I am fond of the backdrop in this piece, and in particular the sky; there's a lovely, painterly quality to it that one couldn't help but feel would be missing in a typical kids' dinosaur book today. 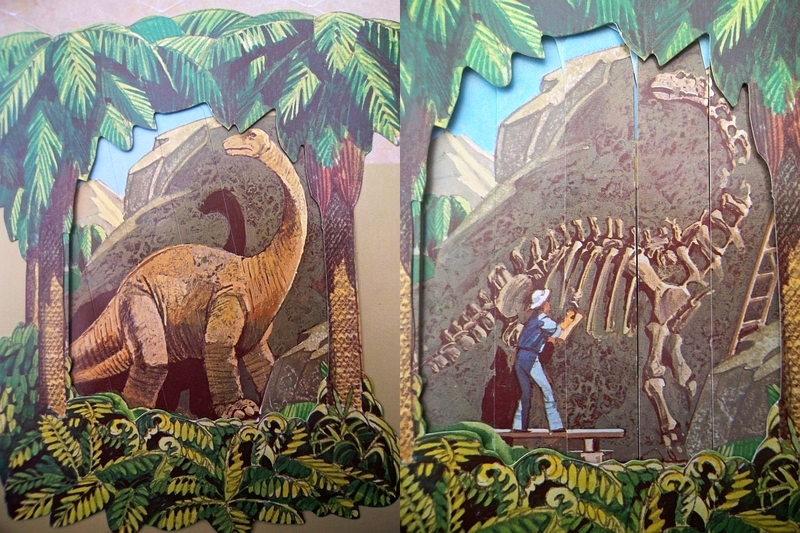 And finally...an endearingly retro pop-up mountain featuring the stars of the hour; Brachiosaurus (on land!) is happy to take the limelight, while Tyrannosaurus appears unusually reserved. There's an accompanying map, too, detailing the locations where the various animals' fossils have been found...sort of. It's the perfect way to finish this muddled, but beautifully produced little book. Dimetrodon is probably the most well-known Palaeozoic creature in popular culture, and is known to anachronistically frequent dinosaur movies, toy ranges and the like (and even appears in silhouette form on the wall of the Natural History Museum's 'Dino Store'. Oh yes, I noticed. Cheeky Dimetrodon). John Sibbick's depiction of the beast is perhaps my favourite piece of his that appears in this book. The foreground stars are stunning, of course, and the three-quarter view is perfect for emphasising the animal's deep, narrow skull, its sprawling posture and a general appearance that seems confusing and contradictory at first; it's no wonder that the term 'mammal-like reptile' has tended to stick. That said, it's the wonderful backdrop here that really made me fall in love with the Permian all over again. The glorious vista, populated by a herd of the pin-headed sailback Edaphosaurus, effectively draws the viewer's gaze slowly inward, immersing them completely in this subtly alien world. And the water looks lovely. Given its aforementioned popularity, it shouldn't be too surprising that Dimetrodon makes another appearance in this Doug Henderson piece. 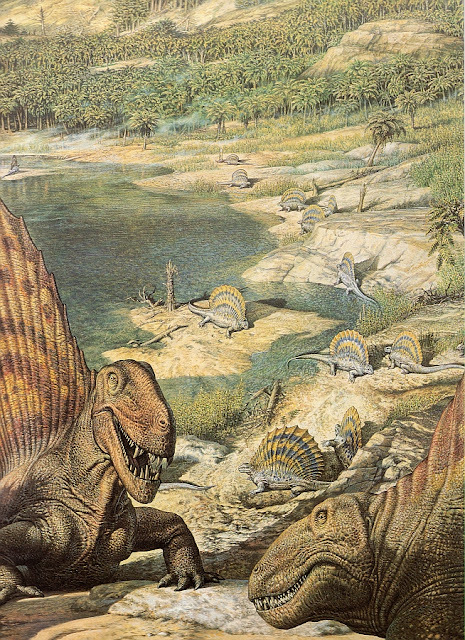 However, whereas Dimetrodon is typically shown hauling itself across the sun-parched earth, here Henderson depicts it taking to the water in pursuit of its prey - and why not? Partially concealed beneath the surface, the Dimetrodon here takes on a startling, bizarre silhouette - a jutting, knife-like fin trailing a vicious set of gaping jaws. It's easy to imagine Dimetrodon going for a dip fairly frequently, given the rich pickings offered in the form of amphibians like these Diadectes. 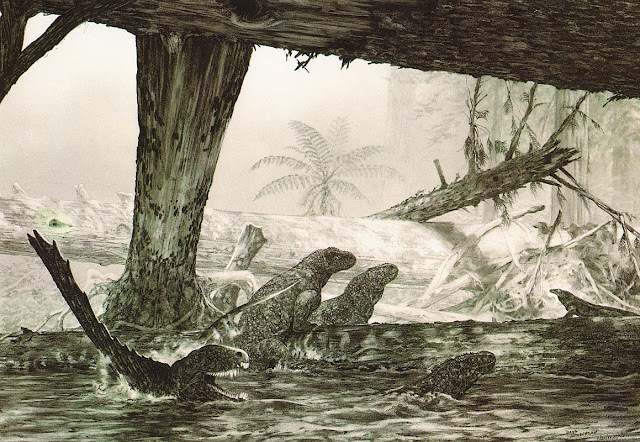 It's the lesser-known Early Permian gang! On the left, anyway. Dimetrodon might get all the glory, but this little lot are the unsung heroes of the period (indulgent in-joke, sorry). The style is unmistakably Sibbick, right down to the last preposterously miniscule warty detail on the adorable Cacops (foreground). 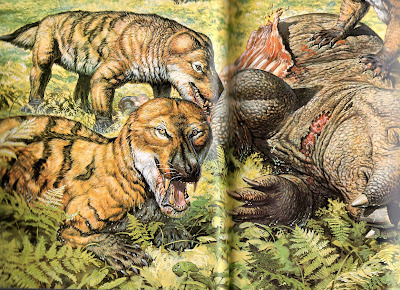 This scene also features the ludicrously shrunken-headed synapsid Casea and, in the far background, the fearsome Varanops which, in spite of appearances, was also a synapsid. The forked tongue would appear to be Sibbick taking the monitor lizard analogy a little too far. On the right, well, I've cheated; this mandible-disarticulating Doug Henderson piece actually depicts a still earlier world - that of the Late Carboniferous, over 310 million years ago. This piece is a spectacular summary of the age as one dominated by enormous, bizarre-looking plants, with Sigillaria looming imposingly from behind a tangled veil of tree ferns. The dramatically leaping animal in the foreground is Hylonomus, the earliest known definitive reptile. While I realise I gush about Henderson non-stop, this truly is one of his masterpieces; I only wish I had an enormous print of it to hang on my wall. 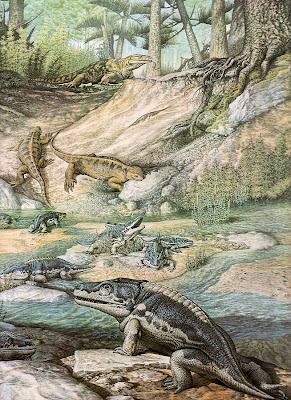 Moving on up to the Triassic, and Henderson provides us with one of the more memorable restorations of Postosuchus to feature in a popular book. Here, the sinister archosaurian macropredator adopts a nonchalant air as it tosses a young Desmatosuchus to the skies, perhaps with the aim of breaking off a few of those unpalatable spines. Yet another example of Henderson's superb and original compositions - a brilliant imagination to match his artistic flair. Gush gush gush. I hear his feet really smell*, though, which is important to take into consideration. Just remember that. Anyway, the top illustration, by Sibbick, makes for a charming profile of the creature with a typically lovely, peaceful ambience. The lower illustration, by Mark Hallett (he's back! ), is a detail from a larger piece in which an unfortunate individual is being reduced to raw hamburger by a ravenous gang of Cynognathus. I can only apologise, again, for not being able to reproduce more of it here - however, this detail does show Hallett's remarkable, seemingly intuitive grasp of what makes a painted animal appear truly alive. And finally...some ichthyosaurs. But wait, stifle your yawns at the back, for these are giant ichthyosaurs - Shonisaurus! The rather rotund restoration of the animal dates this picture a little now, but it remains astonishingly beautiful; the oceanic murk is realistic enough to be eerie, and the dappled sunlight on the backs of the animals is fantastically well observed. The LITC Contest is Now Closed! Thanks to everybody who submitted art to the first ever LITC art contest! We really appreciate your contributions. We'll be huddling up in the coming weeks and going through your entries, so hang tight and keep an eye out. There's some wonderful art here, folks. Be excited! After an astonishingly long delay, I'll now return to Dinosaur National Monument, which Jennie and I visited briefly in June of 2012. In today's post, we'll enter the recently rebuilt Quarry Visitor Center, the home to the monument's most famous feature, the steeply inclined bonebed chock full of dinosaur parts. It is a small facility, but rich with paleontological goodness. First, that quarry wall. I appreciated the focus on the history of paleontology offered by the monument, and this relic of the old Carnegie Quarry offers travelers a rare chance to see dinosaur bones in situ. It's a canny choice; it's easy enough for the layperson to pick out individual bits of anatomy, but it's not a Hollywood version of a dig (i.e. the perfectly articulated, lightly buried Velociraptor from Jurassic Park's opening scenes). Here, you stand on a spot where titans were entombed, and those visitors patient enough to ponder the sight will walk away enriched. The remodeled Quarry Visitor Center also includes a nice array of interpretive materials, fossil casts, and artwork, all of which come together to give visitors a well-rounded view of this slice of Utah's Jurassic heritage. In concert with the welcome center, this part of the park is well-designed to give the attentive visitor a deeper respect for the science of paleontology as well as its most famous subjects of study. The often back-breaking work required to interpret fossils is given its full due. I loved watching a short silent movie dating from the twenties, Monsters of the Past, while I waited to board the shuttle to the quarry. The monitor sits amid a historical set piece which displays reconstructions of human artifacts and fossils as well as press clippings. The materials in the QVC flesh out the story of scientists and dinosaurs on this spot, separated by a vast expanse of time. Fossil remains and paleontology history aside, one of the most exciting aspects of the new visitor center is the new mural by the Walters and Kissinger team. It is a masterful piece of work by Bob, Tess, and their dedicated assistants. This team included the multi-talented Jenn Hall of Clever Girl and Jeff Breeden, who provides an overview of the entire 86' of the mural at his blog. It is a magnificent sight, and I can hardly do it justice with photos. It must be seen on site, slowly, as tourists and children clatter around you. These details can only serve as an appetizer. I love the pairing of this mounted Allosaurus displayed in front of its painted counterpart. As if they are hunting partners, stalking the same spot, but separated by a hopeless expanse of time. 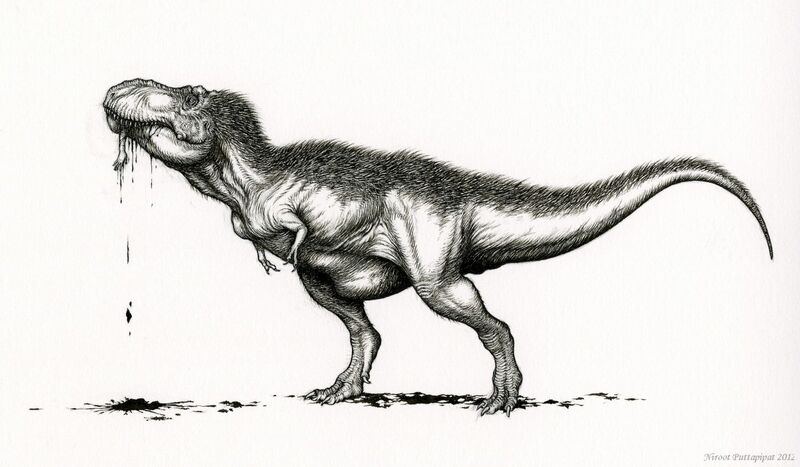 For those of us who love the history of dinosaur art, they provide this nod to a classic Charles Knight illustration. 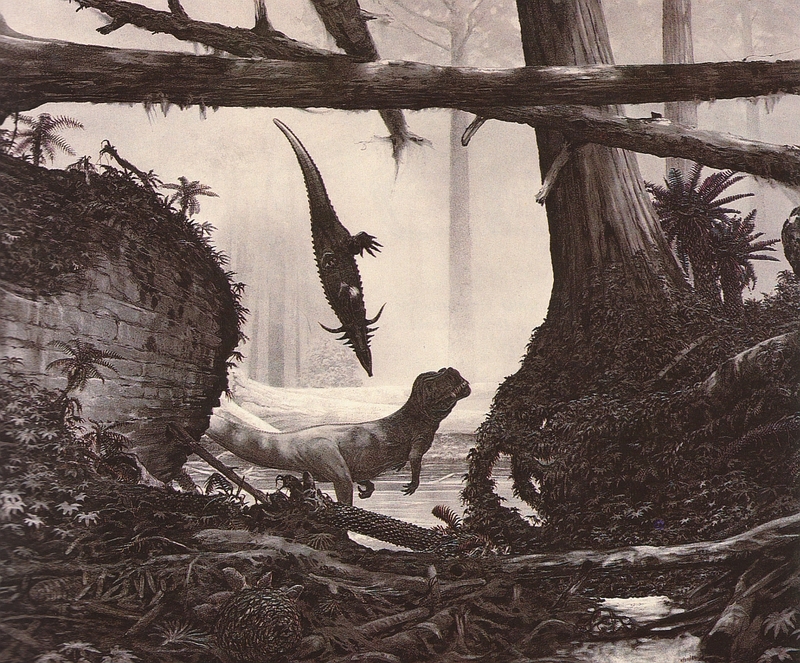 But the work is hardly stuck in the past, as this well-quilled Dryosaurus, menaced by a Torvosaurus, displays. Nor does the mural gloss over the more gruesome aspects of Jurassic life. Their work also serves to illustrate didactic panels which flesh out the Morrison ecosystem represented at DNM. The mural leads visitors to the Quarry Visitor Center's exit. After melting into Mesozoic reverie, imagining the smell of decay in the humid forest and the alien sounds of the saurian menagerie, you walk into the dry sunlight and the contortions of the Morrison and Cedar Mountain formations. If even a small percentage of the monument's visitors are struck by the poignance of deep time and our tenuous walk on its thin skin, the time, money, and effort spent by everyone who built this monument will have been well spent.